Since the Outriders turned out as well as they did I figured the Drakhun could use a chocobo mount as well. That being said much of the methods used building those apply when building this one. I may or may not shamelessly copy/paste content from that post where applicable. DISCLAIMER: Some of my methods MAY/WILL be questionable to some/most (lack of pinning for one) but ideally some stuff shown here will be helpful. This project is starting from a previously painted model that was done back in the Mark 1 days. I think that fact shows. one of many words to describe the above: garish. Standard procedure here is to introduce THAT to a vat of Simple Green to remove the paint and have a “clean slate”. I didn’t do that. Probably should have, moving on. Removing the horse bits we’re not using: Face, front legs, tail. The pose of this guy is much better suited to becoming a chocobo than the outriders. Building their feet. Mostly just rolling some GS into sausages and cover up the hooves. I had a leg up on this one as I’ve already made the “cloning vats” while building the Outriders before. 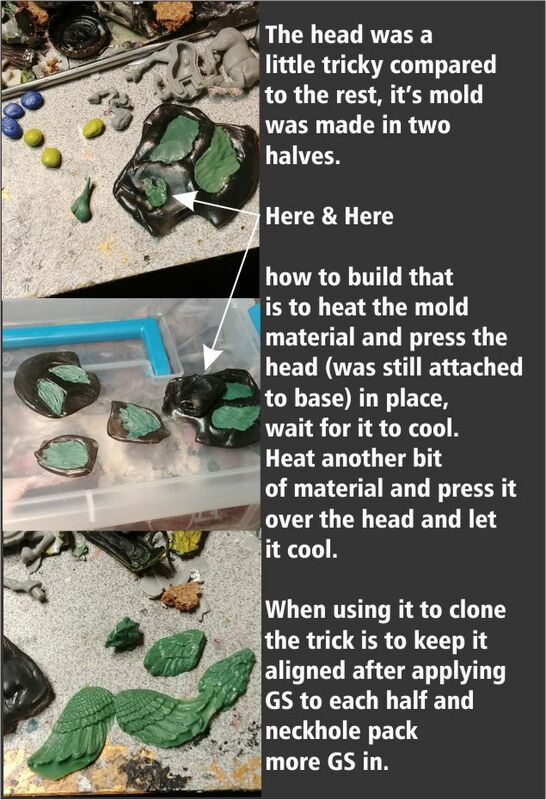 Here’s how much of each part was cloned. Taking our cloned bits we apply them to the body and aside from the legs cover horseflesh in plumage via Greenstuff. Priming, Basecoat, drybrushing then detail. After the Outriders this was pretty formulaic. Just happy it’s only one this time. Either is good by me. Made out of Dryer Sheet, White glue mixed with water. Cut the Dryer sheet into appropriate size (double layered as shown. Super glue the edges to the model. Next create a mixture of white glue and water. Brush it on the Dryer sheet with an expendable brush. Manipulate the cape into a shape you like, you will probably need props to keep in place as it dries. Add 2-3 more layers of glue water about an hour apart until it can maintain it’s shape. With that done, prime and paint the capes.